Just two weeks ago my vernal pool was quiet and still. I've been waiting for the pool to awaken. Winter's grip has been fast slipping away with the melting snow. Now, my wait is over. The frog calls around the pool are almost deafening and there is some kind of activity wherever I look. With the very balmy weather we had yesterday, the peepers were calling in earnest. They were so involved in making a cacophonous din that they were very approachable, so I was able to capture these close-up shots. Here are two screen shots of a movie I took that show the frog's vocalization techniques. 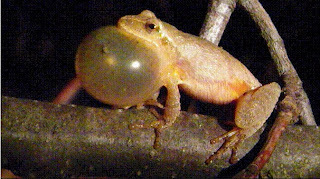 In the left picture the spring peeper is preparing to call by partially inflating its vocal sac and filling its lungs. Then to produce the "yeeep" it passes the air expelled from its lungs (right picture) over its vocal chords into the vocal sac. 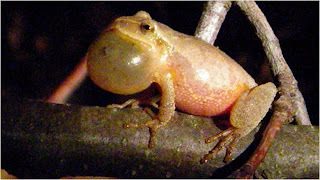 Since the vocal sac is elastic, the air is pushed back reinflating the lungs for another "yeeep". Think of the process as similar to taking a balloon and twisting a constriction into the center then squeezing the air from one side of the constriction to the other. Basically the frog is doing the same thing only with vocal chords in the constriction which are producing the sound. A rather energy efficient system, eh? That loud chorus of spring peepers "yeeeping" is the males calling for mates. The wood frogs are also hanging around the pool. Even a few spotted salamanders were present. That's a lot of salamander! Way out on the top of the mountain all alone in the sleeping woods, my vernal pool has been transformed into a very busy place. Consequently, among all the pool's inhabitants and their interactions, I have many marvels to examine. Here is a book on vernal pools.